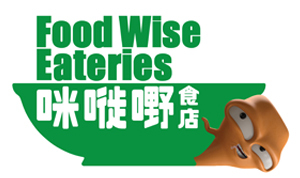 To encourage food eatery outlets in the hotel and food & beverage (F&B) sectors to reduce food waste at source together with customer through offering portioned meals and adopting food waste reduction measures, the Environmental Protection Department has launched the “Food Wise Eateries” Scheme in 2015. Applications are accepted all year round and are FREE of charge. Participants of the Scheme will be awarded with a Food Wise Eateries (FWE) accreditation status if they comply with the assessment criteria and will be granted with the FWE Logo and Stickers for displaying in the premises and their promotion for public identification. 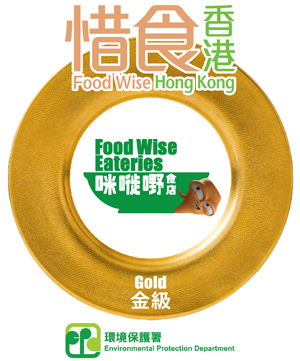 The name of participated eateries with address will also be announced on the website of Food Wise Hong Kong Campaign. Apart from public identification, the participating eateries outlets should be able to reduce the generation of food waste and result in a cost saving through the implementation of their initiatives. Applicants should hold a *business registration (BR) certificate relating to its business and a **valid Food licence/permit issued by Food and Environmental Hygiene Department or a valid Club (Safety or Premises) Ordinance Certificate of Compliance issued by Home Affairs Department. Applicant should submit a copy of a BR and valid licence/permit required for its business operation under the Laws of Hong Kong. Please refer to the Application Guideline for details on the assessment criteria for each class. *Except those Charitable institution or thrust of public character, which is exempt from tax under Section 88 of the "Inland Revenue Ordinance"
The approval Food Wise Eateries (FWE) status will be valid for two years. The list of participating eateries will be uploaded onto the Scheme Website. Each participating eatery will be given a FWE logo for promotion purposes and a FWE sticker for display at their doors/ windows for public identification. All successful applications are valid for two years, except for terminations which will be confirmed by Scheme Secretariat in writing to the eateries concerned. Renewal of interest to participate in the Scheme may be required. The Secretariat will contact each participated eatery three months before the expiry of the FWE status and inform them of the renewal arrangement if applicable.